"The Business Anarchist's Guide to Peak Productivity and Time Management" by Jerry A. Jones is a succinct guide book on how to improve these essential skills so that you can really get the most out of life. From his personal experience creating and selling 14 businesses as well as information from over 20 sources, Jones provides simple strategies and principles that will stretch your productive capacity and carve out time to recharge with loved ones, go on vacation, and enjoy free time. 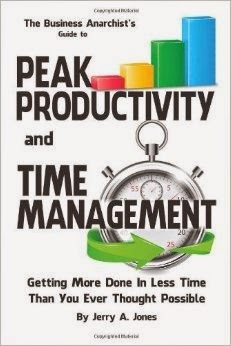 Jones believes that his time management and peak productivity recommendations work best for those who have a good understanding of their own personal motivation to improve in these areas. Although the guide book is relatively short, the content is rich. There are kernels of wisdom in every chapter regarding topics such as communication skills, planning and prioritizing your day, the Pareto Principle, delegation, procrastination and much more. Jones even covers the importance of eating well, exercising, meditating, doing yoga, engaging in positive self-talk, and harnessing the power of the subconscious during sleep to problem-solve by setting a pre-sleep intention. The greatest aspect of this guide is the author's candid and organized recommendations. The book is easy-to-read and cleverly planned. "The Business Anarchist's Guide to Peak Productivity and Time Management" is well-worth your time because it will allow you to be an even better time manager and producer!